Zero Rust Prevention for home, auto or industrial rust penetrating products for all your rust prevention and rust control needs! ZeroRust is a direct metal phenolic modified alkyd rust and corrosion control a coating, which puts down an impermeable rust proofing barrier at the steel level. ZeroRust has two superior traits (1) it provides maximum adhesion to steel or maximum rust prevention - this is called chemical affinity. (2) Its dielectric ability is extraordinary - steel is isolated from the electrolysis process, which converts steel to rust. (In laymens terms, this rust prevention starves the oxygen from the substrate, preventing oxidation.) Zero Rust makes an excellent Original Equipment Manufacturer “OEM” coating and is routinely used on new trailers, new structural steel, new oilfield wellheads & manifolds, new mining equipment, new pump & manifold systems, new power generation skids and new tanks. Zero Rust can give your products the rust protection and prevent rust from appearing again. Continued refinement of the ZeroRust formula has netted ASTM-B117 salt spray testing results exceeding 2000 hours at 3.5 mils dry film thickness (d.f.t.). This equates to 600 hours per dry mil, which was previously unheard of in an air-dry system. The Zero-Rust rust protection performance exceeds that of commonly used red oxide, DTM Acrylics, water-borne alkyds and epoxies on these types of surfaces. ZeroRust rust protection performance has been confirmed by industrial, commercial and marine industry. Black and Red Oxide Zero-Rust are recommended as the primers for corrosive services -- including marine, coastal and industrial surfaces. The effectiveness of Zero-Rust on bare steel surfaces is optimized at 2.5 to 3.0 mils d.f.t. over profile. Rule of thumb: Zero-Rust should provide five years of rust protection for every a mil d.f.t. With the addition of a topcoat or a thicker film of Zero-Rust to take the ultraviolet rays, sealing protection can easily double. The major difference between Zero-Rust and conventional primers is that conventional primers do not increase their ability to control rust with thicker dry film. For most applications we recommend using 3-4 mils dry film thickness over profile(230-290 square feet per gallon recommended foe 3-4 mils), which is achieved with 2 or 3 spray passes of Zero-Rust across the profile of the surface. For corrosive services, we recommend 5-6 mil DFT using the Black or Red-Oxide formulations applied in 2-4 spray passes. ZeroRust routinely replaces epoxies, epoxy mastics, alkyd enamels and rust converter maintenance systems. Epoxies and epoxy mastics are used extensively for controlling corrosion perform better than Zero-Rust in underwater or submerged applications. However, Zero Rust performs well in splash zones and remarkably outperforms epoxies in above marine environments. The drawback to epoxies and epoxy mastics are that they need to be mixed correctly, applied within specific time restriction, and cannot be retouched easily. Zero-Rust advantages include no time restrictions during application; no mixing of components, and Zero-Rust may be touched up at any time. ZeroRust is free of the normal carcinogens found in high performance epoxies and urethanes. Zero-Rust is the perfect rust protection system for the environmentally concerned and those concerned with improving application personnel health safety. Over Rust: ZeroRust design to be applied over existing rust with minimal preparation. Merely wire brush off any mechanically loose scale or powdery rust. Zero-Rust bites through remaining rust encapsulating it in the phenolic resin system. Scale has air entrapped within its structure and must be removed for maximum protection. Heavy rust scale can be softened for easier removal with the use of Zero-Rust Prep Step. Work the surface as smooth as possible. The smoother the surface and the tighter the remaining rust, the less of product will be needed to cover the pitted surface. With Zero-Rust, no Sandblasting required - Environmental considerations are making sandblasting less viable due to waste disposal and containment. Partially rusted, partially painted surfaces: When repairing a deteriorated painted surface, total removal of old paint is preferred. When this is not feasible, treat as you would mill scale from the standpoint that the old paint becomes the weak link in the chain. The cleaner and tighter the surface, the better the resultant job. Pay particular attention to paint edges that may lift and curl. For best results, use a rotary sander to feather out exposed steel to adhering paint edges. Galvanized Steel Surfaces: For aged, rough galvanized steel, ZeroRust will bond with the addition of either 1 tbl spoon of dry Portland cement or half a tablespoon of high calcium hydrated lime per gallon of Zero Rust. Mix thoroughly. For new galvanized steel, use a vinyl wash primer before applying ZeroRust. Protection at the metal level: Most primers are merely a "fuzzy coat onto which paint will hang. Any protection offered by the top coat is then one-step removed from the steel. Zero-Rust will truly protect, isolate and insulate the steel from rust. Recoatable: Zero-Rust is a single component system. Scuff sand to re-coat. Most catalyzed systems do not allow re-coating without extensive surface preparation. Health Safety Benefits of ZeroRust Over Other Mil-Spec Primers: The Zero-Rust rust protection system offers significant health safety benefits over all other high performance primers. Normally high performance in the coating industry indicates urethanes or epoxies which are known “body tissue reactive” materials and therefore cancer causing. The epichlorohydrins and isocyanates all react with water or –OH groups present in all internal & external body tissues. Zero-Rust does not contain any of these components – it is totally non-reactive to body tissues making applications safer, easier and less complicated. Application personnel can feel better about applying these materials knowing of their inherent safety to themselves and others. 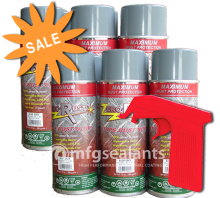 Click the button below to add the Zero Rust 6 Pack Aerosol to your wish list.